NASA's Mars rover Curiosity has revealed no trace of methane, a potential sign of primitive life, on the Martian surface, contradicting past evidence of the gas spotted by spacecraft orbiting the Red Planet, researchers say. The Mars methane discovery, or rather the lack thereof, adds new fuel to the debate over whether the gas is truly present on Mars. And not all scientists are convinced that methane is missing on Mars. But in the past decade, probes orbiting Mars and telescopes on Earth have detected what appeared to be plumes of methane gas from the Red Planet. The presence of colorless, odorless, flammable methane on Mars, the simplest organic molecule, helped revive the possibility of life once existing, or even currently living, just below the planet's surface. On Earth, much of the methane in the atmosphere is released by life-forms, such as cattle. Scientists have suspected that methane stays stable in the Martian atmosphere for only about 300 years, so whatever is generating this gas did so recently. Now, the new findings from NASA's Curiosity rover unveiled online today (Sept. 19) in the journal Science suggest that, at most, only trace amounts of methane exist on Mars. "Because methane production is a possible signature of biological activity, our result is disappointing for many," said study lead author Christopher Webster, an Earth and planetary scientist at NASA's Jet Propulsion Laboratory in Pasadena, Calif. But the findings still puzzle scientists. 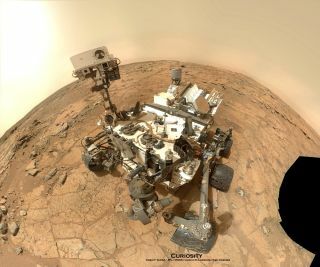 "It's a mystery surrounded by an enigma here," said imaging physicist Jan-Peter Muller of University College London, who is a Curiosity rover science team member but is not one of the authors of this latest Mars methane study. "This clearly contradicts what has been measured from space and from Earth." "Based on earlier observations, we were expecting to land on Mars and measure background levels of methane of at least several parts per billion, but saw nothing," Webster told SPACE.com. When the researchers first looked for methane using Curiosity, they found strong signals that they quickly realized were coming from the little methane that they had taken with them, Webster said — that is, "'Florida air' that had leaked into one chamber during the long prelaunch activities. This contamination has been removed in stages, but each attempt to look for methane from the Mars atmosphere has resulted in a non-detection." The original plan of the researchers was to analyze the carbon isotope ratios of methane on Mars to get insight on whether that gas could be biologically produced. "However, the lack of significant methane has denied that latter experiment," Webster said. This new measurement is about six times lower than previous estimates of methane levels on Mars. Webster and his colleagues suggest this severely limits the odds of methane production by microbes below the surface of Mars or from rock chemistry. "It's an excellent piece of science," Muller told SPACE.com. "However, it's not to say that what is measured 1 meter (3 feet) above the ground is representative of the atmosphere in total — that's a matter of interpretation, not necessarily a matter of fact." For instance, past measurements of methane in the atmosphere of Mars analyzed a region much higher above the surface, "so these might be very different measurements," Muller said. "It does leave a little wiggle room in terms of interpretation." Moreover, when it comes to places on Earth where methane leaks out, scientists can detect large volumes of methane right at the plumes but practically none away from them, Muller said. "It's difficult to know whether the null measurement from Curiosity has to do with being in the wrong place at the wrong time, or whether it is representative of Mars," Muller said. "We are often asked if our measurements at Gale Crater represent the planet as a whole," Webster noted. "We remind others that the lifetime of methane on Mars is very long, about 300 years, compared to the short mixing time — months — for the whole atmosphere, so we feel our measurement does represent the global background value." The Sample Analysis at Mars suite of instruments on Curiosity has yet to conduct a "methane enrichment" experiment that will increase the sensitivity of the rover's Tunable Laser Spectrometer even further — by a factor of at least 10, Webster said. "It's possible that we may then see methane at extremely low levels — or, alternatively, we will not, and our upper limit will go down much further," he added. The ExoMars spacecraft, planned for launch in 2016, will study the chemical composition of Mars' atmosphere to learn more about any methane there. "It can look at the vertical distribution of methane on Mars, see if it's lofted some way high up in the atmosphere or if it's near the ground," Muller said. "If it's near the ground, that's likely reflective of it seeping out of the ground; if it's high in the atmosphere, some exotic photochemical process may be responsible." Webster stressed that Curiosity will continue its mission to assess the habitability of Mars. "The Curiosity rover will continue to make its measurements of both atmosphere and rock samples to discover if organics other than methane exist on Mars," Webster said. "To that end, the jury is still out, as these important measurements are being made in a series of studies that will extend many months into the future. Stay tuned!"